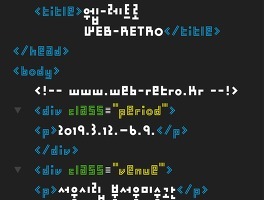 Web-Retro 2019. 3.12 - 6.9 Buk-Seoul Museum of Art www.web-retro.kr WEB-RETRO examines the history of new art that emerged with the World Wide Web and its network, which has fundamentally changed the conditions of communication, image production, consumption, and artistic practice over the past thirty years. With the emergence of the internet, the 1990s and the 2000s marked an era when artists actively be..
the things we have brought the things we have brought_ 2018_alumium, motor, silicone foam_ 25x variable x 25(cm)_ repeat performancethe things we have brought_ 2018_alumium, motor, silicone foam_ 25x variable x 25(cm)_ repeat performancethe things we have brought_ 2018_alumium, motor, silicone foam_ 25x variable x 25(cm)_ repeat performancethe things we have brought_ 2018_alumium, motor, silicone foam_ 25x variable x 25(c..
Solo Exhibition <thing> thing 2018.5.2- 5.22 gallery Chosun, Seoul through the night_ 2018_alumium, motor, fur_ 180x variable x 10(cm)_ repeat performance through the night_ 2018_partWe each play an unknown scenario. It is frightening to look into the unknown. Recognizing the difficult path to comprehend involves the fear of death. We put our losses and progressive memories, such as depression, horror, revenge, and com..
Shapes- An Allegory Jung Sungyoon Solo Exhibition: Minor Threat 2016. 8. 5 (Fri)~ 9. 25 (Sun) KIM CHONGYUNG MUSEUM Shapes/ 2016/ steel, motor, plastics/ 400 x 270 x 90cm 3 pieces Shapes- An AllegoryPark, Choon Ho (Chief Curator, Kim Chong Yung Museum) Jung Sungyoon displays his work titled 『Shapes』 in the upcoming exhibition 『Minor Threat』. It is a work made of two black triangles, which are 2m 60cm in height, 4m i..